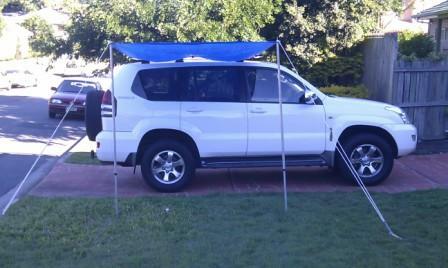 A quick-erect sun and rain awning is a very handy addition to any four wheel drive vehicle. 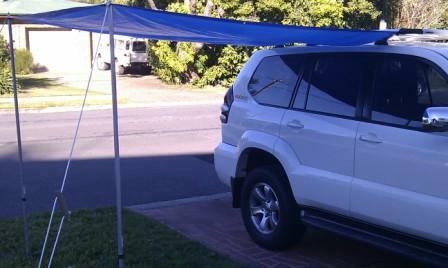 Rather than purchasing an of-the-shelf awning, I have developed my own from some surplus gear in my camping kit. There are numerous different awnings available on the market that bolt semi-permanently to roof racks — examples include those available from ARB, TJM, Bushranger, and OZtrail. I purchased my Rhino-Rack Pioneer Alloy Platform Rack System specifically for its low height to ensure that my Toyota Prado still fits into shopping centre car parks when being used around town. Why would I then bolt on an accessory that increased the overall vehicle height? When camping, my gear is already nearly to the maximum allowable roof load capacity. If I can keep additional weight off the roof, I will. Our next planned holiday includes a road trip from Brisbane to Melbourne and back — more than 3,000 km of highway driving. I do not want the extra wind drag over that distance. Instead of purchasing an off-the-shelf awning, I have developed an easy and quick awning set-up using a 6′ x 8′ tarpaulin, three ball bungee tarp ties, and two poles, guy ropes and tent pegs. My platform rack is long enough to attach the 6′ foot side of the tarp to. However, if you only have a short luggage tray or only roof racks, with the addition of a few extra ball bungee ties, you can attach a third pole to the roof rack, then attach one side of the tarp to the pole. Before going out and buying more gear, as proof of concept I used an old blue tarp, a couple of old tarp poles, two guy ropes I had lying around and a few bungee cords. The awning took about three minutes to set up. As proof of concept, in my opinion it works. I need to be more careful positioning the bungee ties along the roof rack so that it does not sag as it has in the photos above. Other than that, the set-up is easy and very practical. While a 6′ x 8′ tarp may seem small, the undercover area that it provides when used as an awning is actually larger than some of the commercially available awnings. Make sure you select a tarp based on the tarp’s finished size, rather than the cut size, to suit the length of your roof rack. I will now look around for a better quality tarp/awning/fly to replace the cheap blue tarp. That is the beauty of this set-up — you can custom tailor the awning specifically to your needs. You could replace the cheap blue tarp with a heavy duty silver tarp, a canvas tarp, an ultra-lightweight rain fly, or even shade cloth! Using adjustable poles allows you to raise or lower one end of the awning for maximum sun or rain protection, and to allow water to run off the awning in the desired place. I am considering replacing the poles with tri-poles so that they can be packed small enough to fit inside my Prado’s boot. The twist-lock aluminium poles in the above photos are very light and can easily be carried on the roof rack, so they may yet stay as part of the awning kit. Twoja zdolno?? kredytowa wystarczy” Ci na skredytowanie kosztów remontu. Good idea. Where do you get the poles? John. They are just standard tarp poles from a camping store. Rex.